Momma's not even thinking about my elder brother's pregnancy when he rummenigge was a footballer. So, I know nothing about him as a player all I know is that he helped us make shaqiri's deal come true and credit's to him. Interviewed by some local media, Karl-Heinz Rummenigge discussed the deal for Xherdan Shaqiri. "Why did you immediately refuse Liverpool's offer of €20 million?" they asked him. "I don't owe explanations to anyone," said the former Nerazzurri man. "But if you really want to know, it's very simple: the boy only wanted to join Inter and it was the same for us. End of story. I also refused offers from half the continent back in the day so I could join Inter. Inter are Inter." See? Not just rumours. He's a ... certified Interista. A very important one I'd say. I don't play FIFA or FM anymore, but do they have that possibility that the biggest bidder would not get the player in cases like these? Yes. Two teams can make different offers and both of them can be accepted. Then it'd be up to the player to decide which contract they like better. They own the player. They can sell him to whomever they damn well please. Basic rule is that a player cannot negotiate with another club while under a contract, unless his club let's him to. Why the club would give permission is entirely up to the club. Some offer better players, some just have a better connections, some has histories, some aren't threats to their season targets (leauge/cups), or just higher price. For example, Fio hates Milan and Roma hates Juve for their past transfer histories, and usually avoids transfers if possible. Well, there are bunch of clubs/players that talk behind with or without the permission, but anyways that's the rule. Can he give us some more players? Bayern Munich chairman Karl-Heinz Rummenigge says his club did Inter Milan a favour by selling them Xherdan Shaqiri since they could have earned more by selling the Swiss midfielder to England. Shaqiri joined the Nerazzurri during the winter transfer window on an initial loan deal which becomes obligatorily permanent in the summer. The transfer will cost Inter in the region of €15 million -- less than the money Liverpool had reportedly offered the Bavarians. "This is the deal we have," Rummenigge said. "We could have earned more by selling him to England, so we've given Inter a discount." 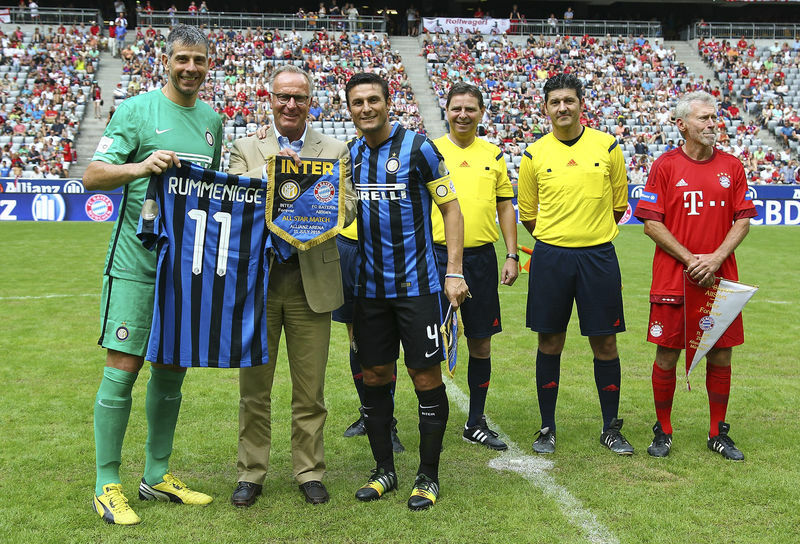 According to the former Inter player, Rummenigge not only did the Serie A club a favour, but he also acted in the best interests of the player. "Shaqiri needed to be playing regularly and I advised him to go to Inter, even though there were lots of English clubs interested," Rummenigge told La Gazzetta dello Sport. "Given the troubles Inter are having, they've hit the jackpot by signing him. He's got quality, he's young and he is capable of making a difference. "He's going to become even more stable as time goes by because he just needs to feel good and feel he's at home." While Shaqiri has had a positive impact for the Nerazzurri, the same cannot be said about Lukas Podolski, who will almost certainly return to Arsenal at the end of his loan spell in the summer with Inter unlikely to exercise their option on the Germany international. "I'm sorry because I know his performances haven't been up to much while at the same time he keeps delivering for the national team," Rummenigge said. "Maybe he's suffering from the fact that he needs to have room to work in and you don't get that room in Italy." Picking up points in Milan appears to be easier than ever this season and this also concerns Rummenigge. "If things carry on this way it will be a pity for Italian football and for European football," he said. "Clubs like Milan and Inter have big names and they belong in [European] competitions. ​In a interview with Gazzetta dello Sport, Karl-Heinz Rummenigge, the chief executive of Bayern Munich, spoke about financial problems Italian football is facing, with teams not getting enough money from TV deals, merchandising and sponsors. The head of European Club Association also told that they need to find a way to help without breaking strict Financial Fair Play rules, which are currently, at this level, damaging Italian teams. “It’s a pity not just for the clubs, but also for Italian and European football, teams like Milan and Inter are big names which are used to the competition (the Champions League). However, complaining does not help. I saw (Inter director) Marco Fassone yesterday, and I immediately thought: ‘five years ago Inter won the Champions League'." “Football can be strange sometimes, but in the last five years something has gone wrong. We need to have a clear plan, with all financial options available, yet without going against Financial Fair Play." Rummenigge, who played for Inter in mid 80's, also stated that current rigid FFP rules are not only damaging the Italians, but major part of Eastern Europe and some big clubs in Western Europe as well. “If you have a hole, you can’t plug it without any fresh money. I’ve read that Milan could be sold, but the new owner couldn’t put in too much money without going against UEFA limitations. So, it’s up to us as big names to find a solution which won’t penalise them any more. I'm starting to like Bayern more and more and he is one of the reasons! That is a man that should lead FIFA or UEFA not the corrupt ones we have right now. Rummenigge: "If you look at the market, it has been quiet this summer. The only major transfers are a 33 year old for 112 million to Juventus and a goalkeeper to Liverpool. Otherwise we haven't seen a lot"